In Japan, the most crucial thing every tourist or local must do is to soak in Japan’s hot spring baths. Their onsen is arguably the best you will ever have since the water is rich with good minerals that are beneficial in maintaining skin conditions as well as treating diseases. Did you know that there are quite a number of onsen theme parks in Japan? 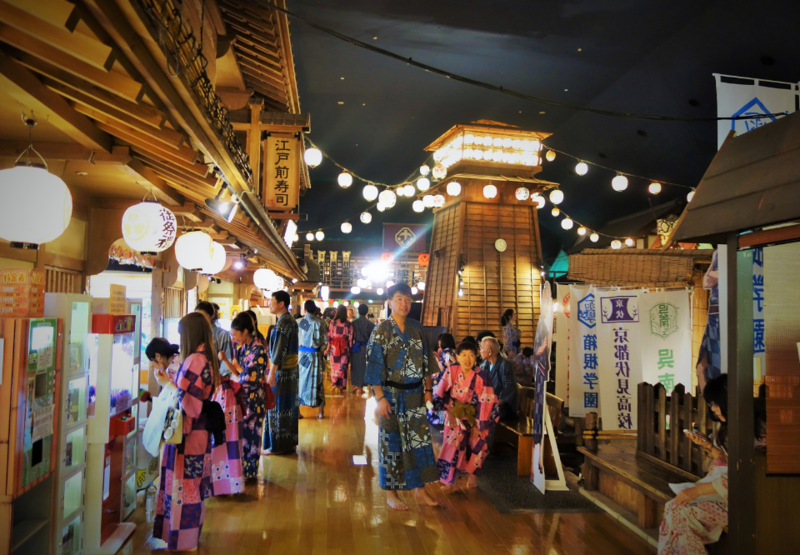 One of the famous onsen theme parks is Oedo Onsen Monogatari and it was the first onsen theme parks in Japan. Opened its business in 2003, this onsen theme park is situated in Odaiba, Tokyo. 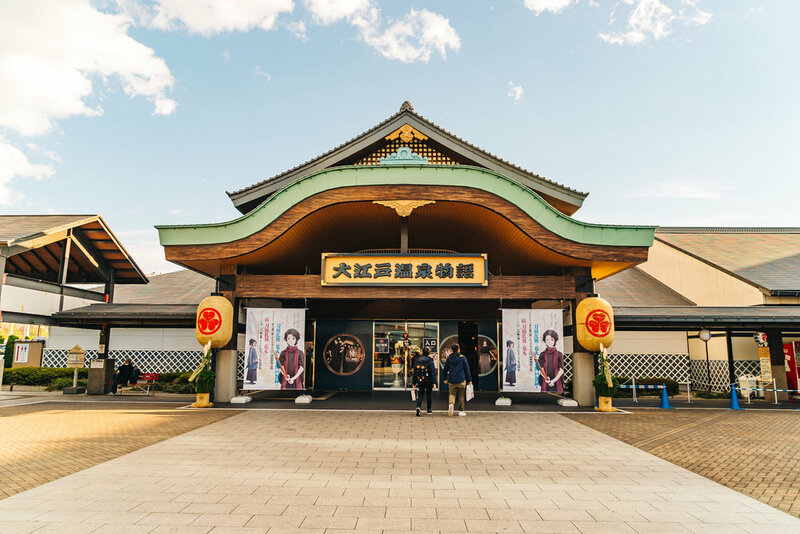 Oedo Onsen Monogatari recreates the streets of Edo Period throughout the facility which what makes this onsen theme park so unique. 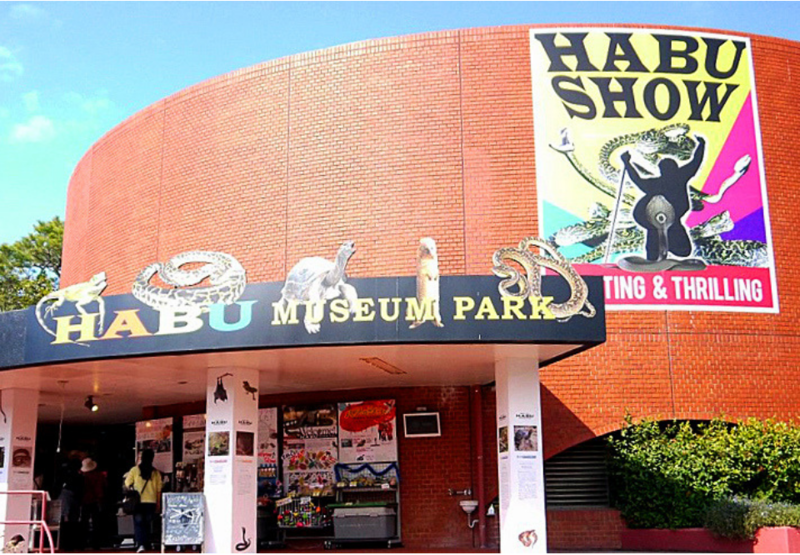 In addition, the park also includes games area, food stalls, hot springs, spa treatments and resting hall. Another good thing about this place is they also provide accommodation to those who feel like spending the night at this Edo onsen theme park. As you enter the place, you need to pay the fee which costs ¥2,720 (for adults on weekday’s entrance). Then, you will receive a wristband with an individual barcode. It acts as your credit card here. Whenever you want to purchase something, just show the wristband. The amount of each purchase will be summed up for you to pay before leaving the theme park. This way, you don’t need to carry your money anywhere you go. After that, go to Echigoya counter to pick out your yukata. Yukata needs to be worn by all visitors inside the theme park. Varies from different colours and patterns, you can choose any yukata you want ranging from size S to XXXL. Please be warned that this onsen theme park doesn’t allow people with tattoos to enter. Since this is an onsen theme park, there are 13 types of hot spring baths for men and women with each unique features. There is a large public bath, silk water bath, the lay-down bath, lukewarm bath, sauna, cold bath, open-air bath, barrels-style baths, foot bath as well as a large and small outdoor bath. 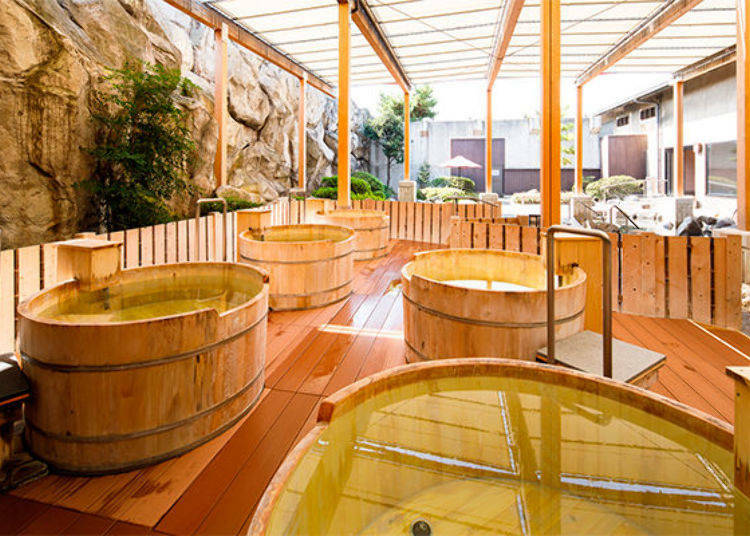 If you have tons of free time, try dipping in all these baths to get various onsen experience. Large bath. Image Source: Jalan.net. The water in the large bath is pumped from 1,400 meters underground and it is very hot. The room is furnished with red Mount Fuji wall mural and consists of several other baths. As for a lukewarm bath, the water generally has the same temperature as our bodies so you can relax in the bath for a long time without feeling getting roasted. Apart from that, make sure you dip into silk water bath because the water makes your skin very soft and it is good for removing dirt. Barrels-style bath. Image Source: Live Japan. Moving on to the exterior part of the theme park, there is a fish therapy where they use small fishes to remove the dead skin cells off your feet. While dipping your feet into the bath, you might feel a slight ticklish sensation. Please take note that the fish therapy has a separate fee and if you wish to do this, you have to pay for the service. Moreover, you will also notice a river loaded with massage rocks. Step on those rocks if you can bear the pain as it helps to relieve sore feet. Other than that, you can just walk around the park and enjoy the beauty of it. Let’s time-travel to the Edo Period in this food and games street. They decorated the street with lanterns, tall tower and there is a huge dining area located in the middle. Here, you will find many great foods with plenty of choices to choose from. Some of the foods you can enjoy are like ramen, udon, sushi and yakitori. For a more lavish dining, head to Kawachou to eat Kaiseki cuisine. Even so, the price in this private restaurant is a little bit expensive than the street foods. For desserts or any light bites, you can try the famous Marion Crepe stall. 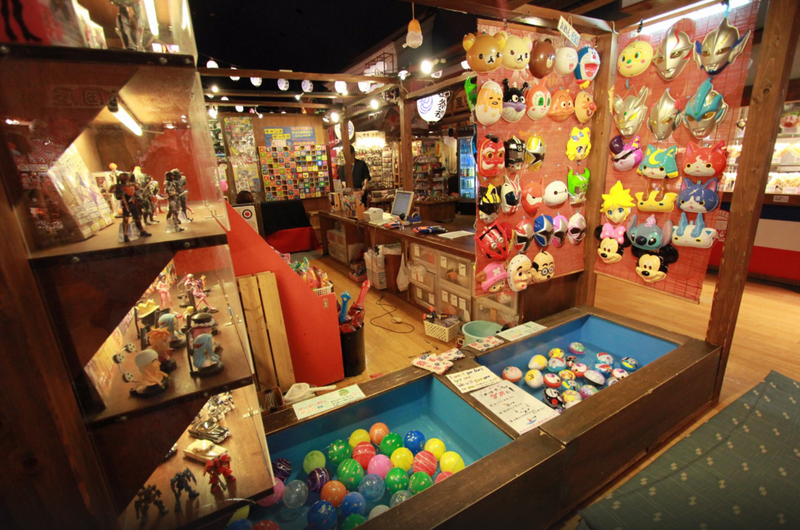 The shop originated from Harajuku and has opened many branches across the world. Since it’s located inside Oedo Onsen Monogatari, Marion Crepes created a special crepe called Odaiba Oedo Onsen Special. The fillings include matcha ice cream, strawberries, whipped cream and cheesecake. After that, try and play Japanese traditional childhood games such as Ninja Star, Sukuu-Bei, Yoyo Tsuri and others. To those who love knowing what their future will be like, head to Fortune Teller stall. 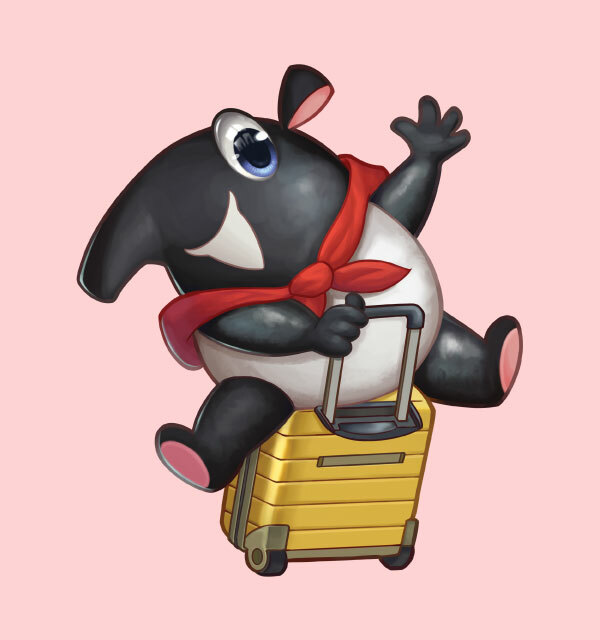 Unfortunately, it is available only in Japanese. Image Source: Albert in Axle. 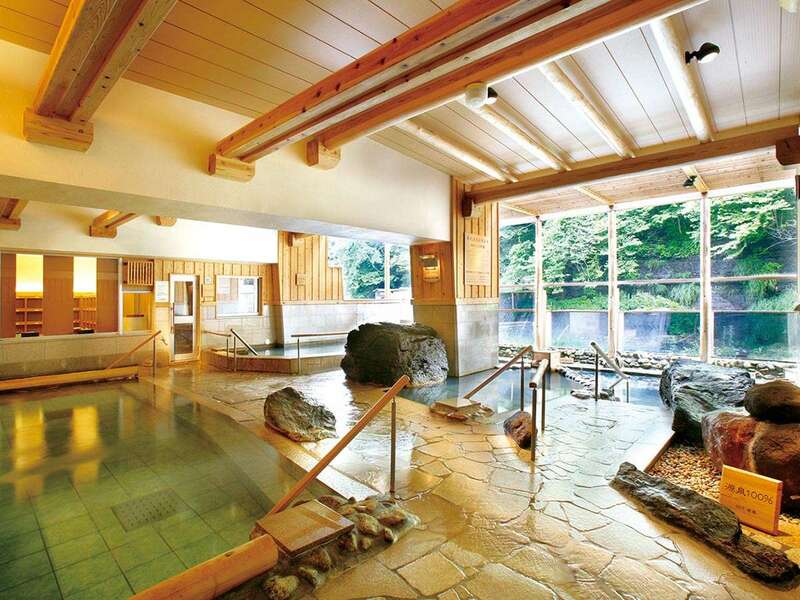 After spending hours in the onsen theme park, take a break and relax at the spa facilities. Oedo Onsen Monogatari offers its guests with various services. For instance, in aesthetic treatment, you will be massaged using Thai natural oil, meanwhile, Akasuri helps to remove dead skin through body exfoliation. Other than these two, there is a head spa, full body massage and foot reflexology. You can also go for rock salt bath in four seasons-themed rooms. For example, in the summer room, the ceiling is painted with stars. So you can imagine what it would feel like gazing at the stars while soaking in the rock salt bath. 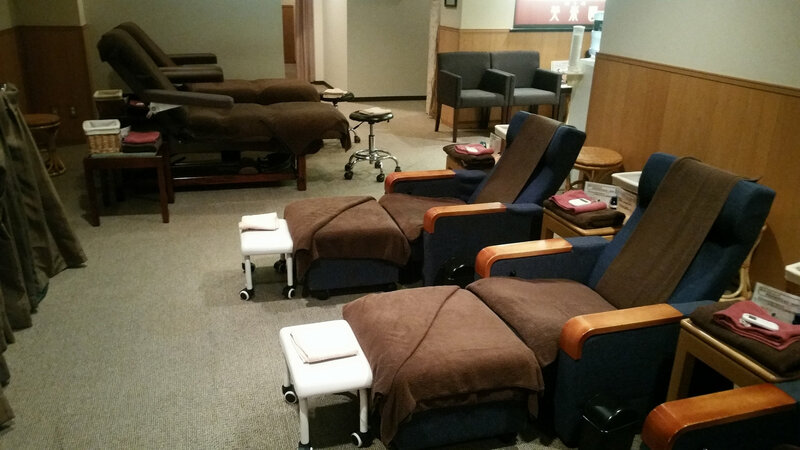 Well, what better way to round off your day than to rejuvenate your body? Foot Reflexology. Image Source: Pack Pack Go. 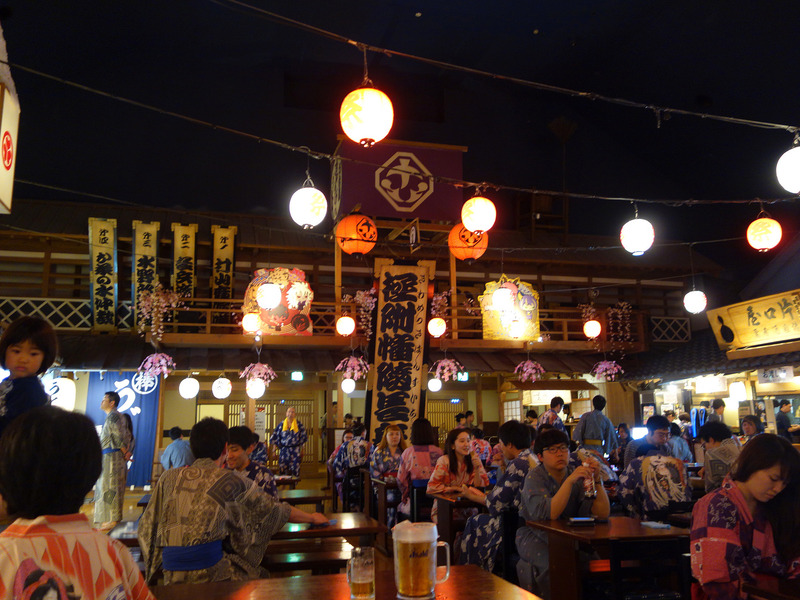 As we mentioned earlier, Oedo Onsen Monogatari provides accommodation to those who would like to spend the night. Over 92 rooms are available here and you can opt for either Japanese or Western-style rooms. We need to remind you that the cost per night at this hotel is very pricey. If you are not on a tight budget, you can overnight here. If not, you can just leave the onsen theme park when the clock hits 2:00AM as there is an extra fee for those who stay after 2:00AM. 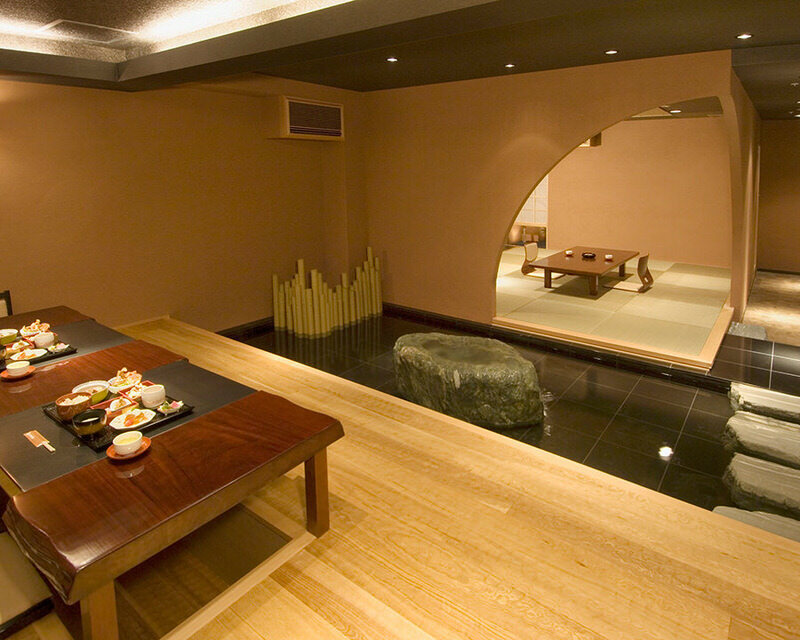 Nevertheless, the rooms are very beautiful and some rooms have a private hot spring bath too. The price can stretch up to ¥17,000 per night and it will increase during peak season. Alternatively, you can stay at Kurofune Cabin which costs ¥4,900 per night. This cabin is more like a capsule-style hotel and unfortunately, it is strictly limited to only males. 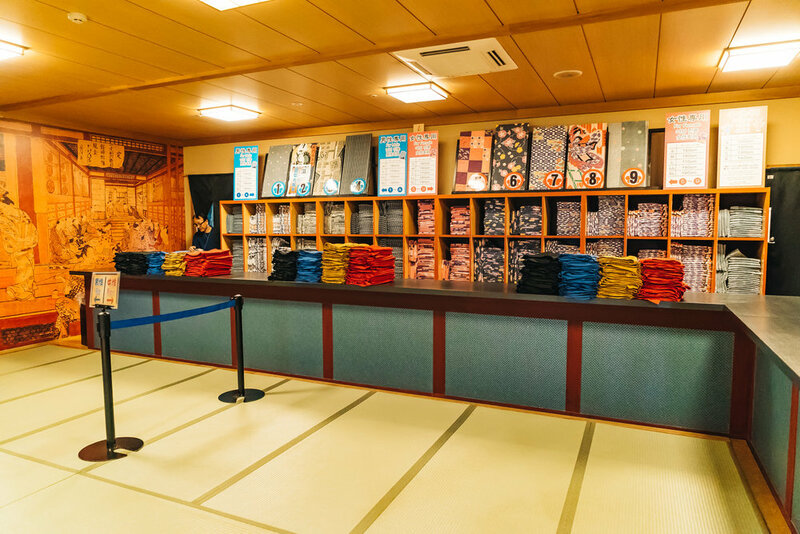 Before exiting the theme park, return the yukata to the counter and make payment after they scan the barcode on your wristband.